Many researchers make use of thresholding and morphological operations for feature extraction and segmentation. Efficient operations are still not included in the existing dental software majorly used by dental practitioners. Hence, the effective benefits of these methods are still not available to the end users. Some of the research work has been reported for human identification, but very few researchers have applied and realised the methods for diagnosis purpose. Geometrical features for measurements like area, length and angle are not detected by all software even though they are considered the basic features especially for the diagnosis of intra-oral diseases. Interactive portions of X-ray selected for further processing specifically for the purpose of diagnosis is the need of the hour as it would help both doctors and patients to understand the problem and depth of disease. No software exploits the power of AI tools and techniques such as neural network and fuzzy C-means. The usage of such methods may help better in identification and diagnosis of dental cavities. 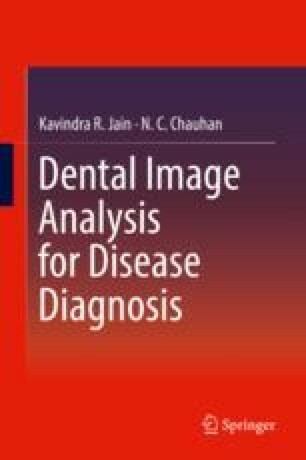 Exploration, development, and use of different automated and semi-automated methods for the analysis of dental radiographs may lead to progress in the knowledge and usage of more such methods that can be used for identification and diagnosis of some dental diseases. The overall contribution of this thesis attempts to make progress on these objectives which may finally contribute as an add-on help to dental practitioners and patients at large.